Wow, another year rolled by, and I didn't make it to a single match. Don't get me wrong, I'm crazy about our two youngest, but they sure can cramp a cowboy's style! The crazy thing is that all I really want to do is have them hurry and grow up, so we can shoot as a family. I'm just saying: any one of those three can be intimidating, but adding them up makes it worse! I swear I might've asked this last time I was here (a year ago?? ), but does anyone know how I can check the status of my membership w/o bothering the nice ladies @ HQ? It's tough enough dragging yourself back out after too many missed range days, but it's even harder when you gotta meet a whole new bunch of pards, AND you know they're said to be a mite higher caliber than the last bunch you shot with. Brace yourself because I’m gonna fuss at you a bit here.You have some darn good excuses for not shooting recently; new family, moving, I assume the move was because of some sort of career change, etc. But new people and how skilled they are is NOT and should NEVER be one of those excuses. If you haven’t learned by now that SASS people are some of the best human beings on the planet then I feel sorry for you. You’ll get treated like long lost family by champions, middle of the pack shooters and also rans. So if time and $$$ allow you owe it to yourself to get out there and meet your new best friends. Ha, I'm a Marine, I can handle the real talk. Thanks much for it, and taking the time to chime in. I completely understand what you're saying, I've told many a newbie "come for the shootin, stay for the people". I suppose I should've been more clear in my posting that all of those things are putting pressure on my ego, not keeping me from going. I was just getting to the point where I felt I was putting forth a good showing, even took RO I and II. It's more that I don't WANT to show up for the first time having to start from basically square 1 again. I'm just north of Baltimore in the county. All the local clubs are finished shooting for the year. There are 4 clubs in an hour radius of Bmore. We start shooting again in March if the weather holds. Be happy to introduce you to the clubs and shoot with you when the time comes. We're a friendly bunch! 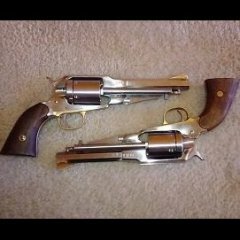 i hear this - i bought full cowboy gun/leather sets for my first grandson , he is just now starting to show interest in shooting - did the same for grandson 2 and think he may well get there first , but its been 7 years getin here , my two girls are another story - i held off on them so far since the boys should grow out of buckaroo stage before they get there , now i need to decide if i plan ahead for the boys growing out of .........or let them decide what they want and just fund it ? Thanks, I appreciate it. I was shooting in Annapolis the last time I made it out, but I'd visited Damascus once, and it's closer to where I am now. Yup, this is exactly where I'm at. Then again they're still 2 and 4, so I *might* be rushing things a bit. You need to come out to Berkeley Springs and shoot with us in the mountains of WV! Beautiful weather, great people, free lunch, and absolutely gorgeous scenery!!! First match is the 4th Sunday in March! Sounds like you are in sore need of a pair of Ruger Bearcats and a Henry JR .22 Rifle. I to am hoping to jump back in after a fairly long absence, good luck. Ha, I'm a Marine, I can handle the real talk. Thanks much for it, and taking the time to chime in.. If you ever find yourself out in Vegas the drinks are on me. Love to, the wife and I were talking about visiting that way this year. How far from Baltimore do you recon it is to where you are? I had a single Ruger 22 for the older, but he never used it, so I passed it along to another. Also a fan of those Henrys. Very nice, just for that, I'll resist the urge to make Chair Force jokes. My Father in Law is retired Air Force, my Brother in Law is still active Air Force, and another Brother in Law was Army. When we all start trash talking they tell me they have me outnumbered, I tell them that just about evens up the odds. I brought my Father in Law to one shoot, and even helped him to come up w/an alias: Wingnut John. We are about 2 hours from Baltimore. I am in the same situation. My boy is four and a half and not too fond of loud noises. Combine that with a crazy year at work, and I don’t shoot all last year either. I bought the boy an ivory gripped 44-40 Colt SAA the week he was born and he has some other nice things for when he gets older. I hope he will get interest in shooting as he gets older and wants to shoot sass with me. But, till then I hope to get out and get some shooting done. Suffice it to say, similar circumstances, and I miss it too. That's not too bad. We're about 30 mins west, so maybe only 1.5 hours to you? "...Yup, this is exactly where I'm at. Then again they're still 2 and 4, so I *might* be rushing things a bit. ...."
I miss is too but it's only been two weeks because of the rain. They'll be old enough to bring before you know it so hang in there. Everything Shooting Bull said plus the only way to get better is to shoot with better shooters than you. If you've found yourself located in an area with some really good shooters count yourself lucky and go learn all you can. One more thing, never wish your kids youth away. They'll be grown and gone before you know it. From an older feller's perspective, trust me, things you think will 'never get here' are actually just around the corner! Perfect answers from a great guy. Heck, if I worried about where I ended up in the scores, I'd never shoot. After all those "higher caliber" folks wouldn't be higher unless some people didn't let being lower bother them. Just get out and enjoy it like you did in the past.